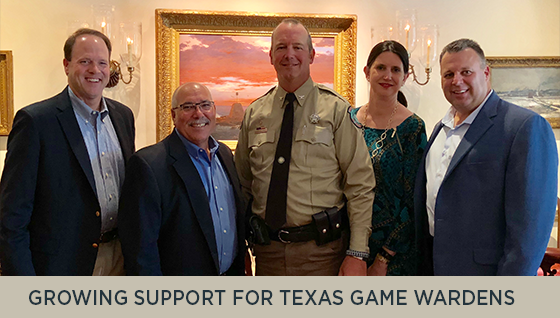 Thanks to the generosity of hundreds of Texans, the Gear Up for Game Wardens effort has raised more than $360,000 since the program launched nearly a year ago, providing funds for much-needed specialty gear. In the dead of night, the bad guys do their dirty work. This is something game wardens across Texas know well. Whether it’s committing flagrant violations such as gill netting in the Gulf of Mexico or oystering in Galveston Bay, many poachers who commit these crimes do so in the dark of night. "We have eight game warden regions and we have a need for night vision equipment in every single one of them,” said Colonel Grahame Jones, who leads the Law Enforcement Division at Texas Parks and Wildlife Department. “Under the cover of darkness, it’s easier to take advantage of the natural resources that belong to all Texans. 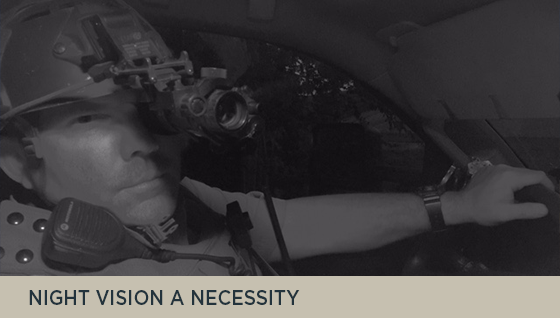 Night vision equipment is a crucial tool for game wardens." Night vision goggles are also used by wardens to prevent poachers who night hunt or trespass on private land to poach game illegally. And they are critical tools during hazardous search and rescue operations when wardens are first responders looking for victims of flooding and other natural disasters. You can help provide these critical tools to Texas Game Wardens. On September 25, a fundraiser was held in Houston to support equipment needs for Texas Game Wardens across the state. Pictured above is TPWD Executive Director Carter Smith, Council member Vence Petrenella, Colonel Grahame Jones, volunteer Betsy Grubbs and Council member Randy Risher. Events like this demonstrate how much Texans support their game wardens. Events have been held in Colorado, Dallas, Denton, Frio, Gonzales, Jefferson, Travis, and Walker counties. Additional events are planned for Burnet, Tom Green, and Washington counties in the coming months. You can support Texas Game Wardens, too. Stormy McCuistion had a career epiphany when he was in the fifth grade. 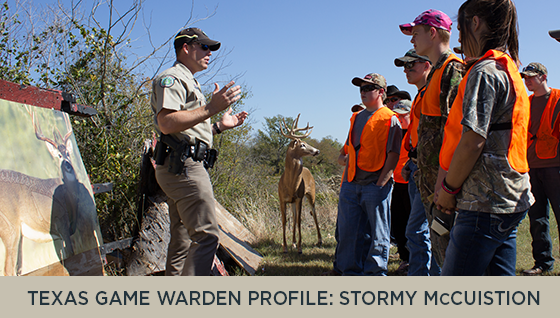 A classroom visit by a Texas Game Warden set the course for his future. Stormy knew that if he wanted to be a Texas Game Warden, he would have to set his standards high. "I stayed out of trouble in high school and made good grades because that’s what I knew I had to do. I knew I had to work hard to always do the right thing." After high school he graduated from Texas A&M with a degree in agricultural development and a minor in wildlife and fisheries science. He applied to the Texas Game Warden Academy and was thrilled to be accepted on his first try. “It was literally a dream come true,” he said. He graduated from the Game Warden Academy in 2007 and worked in Denton County for 11 years. He just recently transferred to Cooke County, north of Denton, near his boyhood home in Sanger. While in Denton County, Stormy worked more than 60 drowning cases on Lake Lewisville, grim duty that takes a toll. In recent years, game wardens have begun using high-tech sidescan sonar equipment that makes the difficult job safer and easier. But the expensive equipment is not available to all wardens, which is one reason Gear Up for Game Wardens was formed. Thanks to the new program, sidescan sonars are more widely available for use to game wardens across the state. Stormy was involved in a recent Denton County Gear Up for Game Wardens fundraiser that garnered more than $20,000 for local equipment needs. As a direct result of that effort, much-needed specialty equipment was purchased for the region’s wardens, including night vision goggles and thermal riflescopes. Night vision goggles can make the difference between a search and rescue operation that takes minutes instead of hours. "It goes to show that Gear Up for Game Wardens is absolutely working,” said Stormy. “It’s not only working for game wardens in the field, but for victim’s families, too." For Texas Game Wardens across the state, Gear Up for Game Wardens is making a big difference in providing tools they might not otherwise have. "Specialty equipment allows us to have the newest tools of the trade to do our work most efficiently,” he said. “We really appreciate the support from the neighbors in our communities for Gear Up for Game Wardens." For more info visit www.gearupforgamewardens.org.